Parents : Sardar Gurdev Singh and Mata Gurdev Kaur. Brother/Sisters : 3 sisters Bibi Dishprinder Kaur, Bibi Kulwinder Kaur, Bibi Baljit Kaur and a younger brother, Bhai Harwinder Singh..
On 19th April 1989, Bhai Sahib and fellow singhs entered the State Bank of India branch in the city of Sadul, district Ganga Nagar. Even aft being warned, the bank manager triggered the alarm and the singhs could only leave with 73000 rupees. It is said that the land of Punjab, is the land of warriors, but when we look into the Sikh history, it comes to light that the land of Rajasthan also has its fair share of Sikh warriors. The people of Punjab and Rajasthan are hard workers, honest and full of self-respect. May it be the 18th century or the 20th century, Rajasthan has always made some of the great warriors that have played an important part in the Sikh Freedom Movement. To stamp out Sikhi, the Hindu Prime Minister, Indira Gandhi ordered her army to attack Sri Harimandir Sahib in June 1984. The Indian tanks and cannons destroyed Sri Akaal Takht Sahib, the Indian army killed innocent Sikh pilgrims on the Parikarma of Sri Darbar Sahib. As well as attacking Sri Harimandir Sahib, the Indian security forces also attacked 37 other historical gurudwaras surrounding the Amritsar area. Sant Jarnail Singh Ji Bhindranwale, Bhai Amrik Singh, General Subeg Singh, Baba Thara Singh and thousands of Sikhs gave shahadat on the complex of Sri Harimandir Sahib. Then on 31st October 1984, Bhai Beant Singh and Bhai Satwant Singh killed Indira Gandhi and avenged the killing of innocent Sikhs. 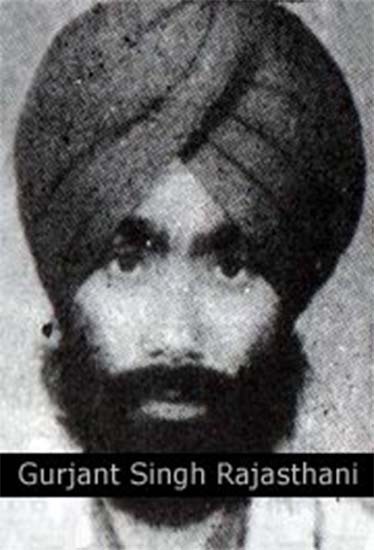 On 10th August 1986, Bhai Sukhdev Singh Sukha and Bhai Harjinder Singh Jinda killed the army general who commanded the army to attack Sri Darbar Sahib, General Arun Kumar Vadiya in Pune. Bhai Sukhdev Singh Sukha was also from Rajasthan, as well as Bhai Balwinder Singh Raju and Bhai Jagjit Singh Gill. When we talk about the Generals Sikh Freedom Movement, who fought for the homeland of Sikhs, Khalistan then two Gurjant Singhs come up, one of Khalistan Liberation Force’s Jathedar Bhai Gurjant Singh Budhsinghwala and another Khalistan Commando Force’s Jathedar Bhai Gurjant Singh Rajasthani. If anyone wants to read up on the bravery of Bhai Gurjant Singh Rajasthani the read the newspapers from 3rd September 198, when Bhai Sahib broke out of police custody till 31st August 1991, when Bhai Sahib attained shaheedi. In this time there might be rare day that the daily Ajit newspaper may have not printed an article on Bhai Sahib’s brave actions. Bhai Gurjant Singh Rajasthani was born in the house of Sardar Gurdev Singh and from the womb of Mata Gurdev Kaur in the year of 1965 in 66RB near Rai Singh Nagar, district Ganga Nagar of Rajasthan state. Bhai Sahib was the eldest of his brothers and sisters. Bhai Sahib had 3 sisters Bibi Dishprinder Kaur, Bibi Kulwinder Kaur, Bibi Baljit Kaur and a younger brother, Bhai Harwinder Singh. The family married Bhai Sahib to Bibi Sukhwinder Kaur, daughter if Sardar Mohan Singh from Rai Singh Nagar. In Ganga Nagar jail, Bhai Sahib came in contact with the Khadku Singhs of Sikh Freedom Movement. On 3rd September 1986, when Bhai Sahib was being taken to the city of Bikanair for his hearing the Khadku Singhs attacked the police convoy and freed Bhai Sahib and Bhai Rajinder Singh Raji. In this action, some police officers lost their lives. From that day onward’s Bhai Sahib joined the Sikh Freedom Movement and never looked back. Bhai Sahib was labelled wanted by the Rajasthan police. After escaping from police custody, the first meeting Bhai Sahib had with the Rajasthani police was on 24th August 1987 near Rai Singh Nagar, in a historical gurudwara Budha Joharh Gurudwara. A lot of Sikh sangat had gathered at the Gurudwara, Bhai Sahib and fellow singhs were attending this event at the gurudwara. The police were also at this event looking for Bhai Sahib. The police recongnised Bhai Sahib and surrounded the whole event and asked Bhai Sahib to put his hands up. Bhai Sahib put his hands up and then the police used their wooden batons to disperse the sangat. As the police moved towards Bhai Sahib, the fellow singhs of Bhai Sahib who were mixed into the sangat fired bullets towards the police. In the firing three police officers were killed and many wounded. When the singhs fired at the police, the police officers started running for their lives. Bhai Sahib and fellow singhs were successful in escaping safely. Jaipur – 24th August 1987, today in Rajasthan, Khadku Singhs carried out a big action in which 2 police officers along with another 3 men were killed and 2 more were wounded when the Khadku Singhs blindly fired bullets into the crowd. The action happened in district Ganga Nagar at the Sikh historical Gurudwara Budha Joharh. A police officer, Jagdish Singh hid and managed to escape. The names of the police officer that were killed are Hawaldar Dalip Singh, Constable Asu Singh and a truck driver, Mogan Singh. Khadku Singh were a group of 4 and fled the scene in a blue jeep. The police team were deployed as security at the religious event. At the time when this action happened, the police officers were drinking sweet water. The Khadku Singhs thought that the police was looking for them. The 4 Khadku Singh from which 2 were in turbans and another 2 were haircut, started blindly firing bullets at the police. Before firing the bullets, the Khadku Singhs shouted, “Anyone who harasses the Sikhs in Rajasthan, better take this as a warning and stop their harassment or else I will start harassing them.” The Khadku Singhs have also left a letter at the scene of action, in which the Rajasthan government is told not to harass the Sikhs of Rajasthan. The state minister said that the DIG and CID have been sent to the scene. In 1987, Bhai Sahib came home and said that he is going to take his wife and son away with him, but rest of the family was against this decision said, “You yourself are wanted by the police, tell us why are you going to drag you family with you?” But Bhai Sahib did not listen to no one and took his wife and son with him. After this Bhai Sahib never came back home and nor did the family know where Bhai Sahib was living with his family. Now Bhai Sahib had joined the top Khadku Singhs and started doing big actions. Bhai Sahib had earned the respect of Baba Gurbachan Singh Manochahal, Bhai Seetal Singh Matewal, Bhai Gurdev Singh Usmanwala and also of Baba Thakur Singh Ji Bhindranwale. After many documented actions of Bhai Sahib on the national newspapers, which proved the loyalty, bravery and honesty of Bhai Sahib, the Khadku Singhs gave the lead of Khalistan Commando Force Rajasthan to Bhai Sahib. Bhai Sahib’s Khalistan Commando Force group had the like of sings such as Bhai Kulwant Singh Kala Arifke (Chhota Rajasthani), Bhai Subeg Singh Lubhania Wala, Bhai Mahinder Singh Lubhania Wali, Bhai Museebat Singh Verarh, Bhai Kabal Singh, Bhai Satpal Singh Ladian, Bhai Jarnail Singh Shatrana, Bhai Sukhmandar Singh Deep Singh Wala, Bhai Sukhwinder Singh Ladoo and many more brave singhs. 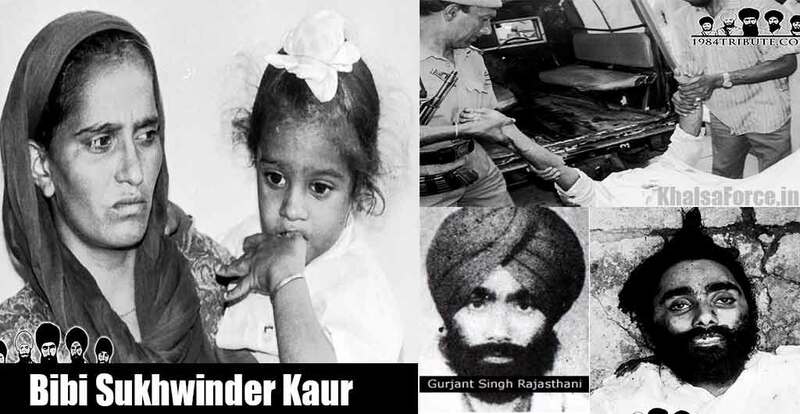 27th April – Batala – Khalistan Commando Force has taken the responsibility for the bank robbery in the Sadul city of Ganga Nagar (Rajasthan) and killing 15 people and wounding over 50 people. Spokesman of Khalistan Commando Force, Bhai Kirpal Singh sent the press note, which takes the full responsibility for the bank robbery and the killings. In this press note the Chief General of Khalistan Commando Force, Bhai Gurjant Singh Rajasthani advises the people of Punjab that on 30th April 1989, the people of Punjab must join the strike where all the roads of Punjab must remain clear, no cars or any other vehicles should be in the road on this day. Top Khadku Singh, Bhai Gurjant Singh Rajasthani killed by police in Mohali. In Punjab another 23 men killed, including 8 Khadku Singh’s. Dharampal Upashak – 31st August 1991 – Chandigarh, On Saturday morning in Phase 7 of Mohali, the Punjab police house number 129 and as the top Khadku, Bhai Gurjant Singh Rajasthani, Chief General of Khalistan Commando Force (Rajasthani) tried to escape, the police shot him dead. The government had put up a 20 lakh rupees reward for the capture of Bhai Gurjant Singh Rajasthani and he was responsible for more than 1000 murders in Punjab, Haryana and Rajasthan. In the house Bhai Gurjant Singh Rajasthani was staying, belonged to Bibi Inderjit Kaur who was the PA of MP Bibi Bimal Kaur. Bhai Gurjant Singh Rajasthani had come here on a blue gipsy jeep with his wife, Bibi Sukhwinder Kaur and son, Bhai Gurpinder Singh. When the police received this information the SSP Mohammed Mustafa and DSP Ajaib Singh with their teams surrounded the house. Bhai Gurjant Singh Rajasthani fired bullets from back of the house as he tried to escape, the police also returned fire in the direction from where the police received fire, the police later found Bhai Gurjant Singh Rajasthani dead. Before dying, Bhai Gurjant Singh Rajasthani shouted slogans of, “Khalistan Zindabaad”, he also swore at the police and swallowed a capsule of Sy-Nyde. Bhai Gurjant Singh Instantly died. ਕੀ ਵਾਕਿਆ ਈ ਡੇਰਾ ਸਰਸਾ ਦਾ ਮੁਖੀ ਭਾਈ ਰਾਜਸਥਾਨੀ ਨੇ ਥਾਪਿਆ? ਭਾਈ ਰਾਜਸਥਾਨੀ ਖਾਲਿਸਤਾਨ ਕਮਾਂਡੋ ਫੋਰਸ ਦੇ ਡਿਪਟੀ ਮੁਖੀ ਸੀ।ਉਨਾਂ ਦੀ ਸ਼ਹਾਦਤ ਮਗਰੋਂ ਬੜੀ ਹੈਰਾਨੀ ਸੀ ਕਿ ਉਨਾਂ ਦੇ ਬੇਟੇ ਸਾਡੇ ਨੇੜੇ ਪਿੰਡ ਕੁਲਾਰ ਵਿਚ ਮਾਤਾ ਸੁਰਜੀਤ ਕੌਰ ਕੋਲ ਗੁਪਤ ਰੂਪ ਰਹਿੰਦਾ ਰਿਹਾ ਹੈ।ਜਦ ਇਸ ਬੀਬੀ ਜੀ ਨੂੰ ਸਾਡੇ ਕੋਲ ਸੁਧਾਰ ਠਾਣੇ ਵਿਚ ਫੜਿਆ ਹੋਇਆ ਸੀ ਤਾਂ ਠੇਕੇਦਾਰ ਸੁਰਜਣ ਸਿੰਘ ਅਕਾਲੀ ਲੀਡਰ ਛੁਡਵਾਉਣ ਆਏ ਸੀ।ਇਸਤੋਂ ਪਹਿਲਾਂ ਖਾੜਕੂਆਂ ਤੇ ਅਕਾਲੀਆਂ ਵਿਚ ਟਕਰਾਅ ਜਿਹਾ ਰਹਿੰਦਾ ਸੀ ਪਰ ਜਦ ਭਾਈ ਰਾਜਸਥਾਨੀ ਦੀ ਸ਼ਹਾਦਤ ਹੋਈ ਸੀ ਤਾਂ ਉਨਾਂ ਦਿਨਾਂ ਵਿਚ ਈ ਅਨੰਦਪੁਰ ਸਾਹਿਬ ਹੋਈ ਇਕ ਅਹਿਮ ਇਕਤਰਤਾ ਵਿਚ ਖਾੜਕੂ ਤੇ ਅਕਾਲੀ ਤੇ ਹੋਰ ਸਿਖ ਜਥੇਬੰਦੀਆਂ ਨੇ ਇਕਮੁਠਤਾ ਕਰ ਲਈ ਸੀ।ਇਸ ਮੀਟਿੰਗ ਵਿਚ ਈ ਵੋਟਾਂ ਦੇ ਬਾਈਕਾਟ ਦਾ ਫੈਸਲਾ ਹੋਇਆ ਸੀ ਤੇ ਇਸ ਮੀਟਿੰਗ ਵਿਚ ਹੀ ਭਾਈ ਰਾਜਸਥਾਨੀ ਦੀ ਯਾਦ ਵਿਚ ਨੌ ਸਤੰਬਰ ਨੂੰ ਗੁਰਦੁਆਰਾ ਫਤਿਹਗੜ੍ਹ ਸਾਹਿਬ ਵਿਖੇ ਸ਼ਹੀਦੀ ਸਮਾਗਮ ਕਰਨ ਦਾ ਫੈਸਲਾ ਹੋਇਆ ਸੀ।ਨਾਲ ਹੀ ਸਾਰੇ ਸਿਖ ਜਗਤ ਨੇ ਇਕਮੁਠ ਬਹੋਕੇ ਸੱਤ ਸਤੰਬਰ ਨੂੰ ਪੰਜਾਬ ਬੰਦ ਰੱਖਣ ਦਾ ਫੈਸਲਾ ਕੀਤਾ ਸੀ।ਉਦੋਂ ਕੁ ਹੀ ਭਾਈ ਬਲਵਿੰਦਰ ਸਿੰਘ ਜਟਾਣੇ ਤੇ ਪਰਿਵਾਰ ਤੇ ਸਰਕਾਰੀ ਕਹਿਰ ਟੁਟਾ ਸੀ।ਮੈਂ ਹੈਰਾਨ ਹਾਂ ਕਿ ਜਿਸ ਭਾਈ ਰਾਜਸਥਾਨੀ ਨੂੰ ਹੁਣ ਡੇਰੇ ਸਰਸਾ ਦਾ ਸਮਰਥਕ ਬਣਾਕੇ ਪੇਸ਼ ਕੀਤਾ ਜਾ ਰਿਹਾ ਹੈ,ਉਹ ਤਾਂ ਉਹ ਸਖਸ਼ੀਅਤ ਹੈ ਜਿਸ ਲਈ ਖਾੜਕੂ,ਅਕਾਲੀ ਤੇ ਹੋਰ ਵੱਖ-ਵੱਖ ਤਰਾਂ ਦੇ ਪੈਂਤੀ ਸੰਗਠਨ ਇਕਮੁਠ ਹੋਕੇ ਪੰਜਾਬ ਬੰਦ ਕਰਵਾ ਰਹੇ ਸਨ।ਜਦ ਅਖਬਾਰਾਂ ਵਿਚ ਛਪਿਆ ਸੀ ਕਿ ਅਕਾਲੀ ਤੇ ਹੋਰ ਸਿਖ ਵੀ ਭਾਈ ਰਾਜਸਥਾਨੀ ਦੀ ਸ਼ਹਾਦਤ ਬਾਰੇ ਪੰਜਾਬ ਬੰਦ ਤੇ ਸ਼ਹੀਦੀ ਸਮਾਗਮ ਵਿਚ ਸ਼ਾਮਿਲ ਹਨ ਤਾਂ ਅਖਬਾਰਾਂ ਨੇ ਲਿਖਿਆ ਸੀ ਕਿ ਇਸ ਫੈਸਲੇ ਨੇ ਹਕੂਮਤ ਨੂੰ ਹਿਲਾਕੇ ਰੱਖ ਦਿਤਾ ਹੈ।ਸੱਤ ਸਤੰਬਰ 1991 ਦਾ ਬੰਦ ਬੇਮਿਸਾਲ ਹੋਇਆ ਸੀ।ਭਾਈ ਰਾਜਸਥਾਨੀ ਦੀ ਸ਼ਹਾਦਤ ਤੇ ਹੋਰ ਹਕੂਮਤ ਜਬਰ ਵਿਰੁਧ ਹੋਏ ਬੇਮਿਸਾਲ ਬੰਦ ਤੋਂ ਬੁਖਲਾਕੇ ਸਰਕਾਰ ਨੇ ਨੌ ਸਤੰਬਰ ਨੂੰ ਗੁਰਦੁਆਰਾ ਫਤਿਹਗੜ੍ਹ ਸਿਹਬ ਵਿਖੇ ਸਮਾਗਮ ਤੇ ਕਹਿਰ ਢਾਹਿਆ ਸੀ ਤੇ ਸਾਰੇ ਸਿਖ ਆਗੂ ਸ਼ਿਕਾਰ ਹੋਏ ਸੀ।ਇਹ 1984 ਤੋਂ ਬਾਦ ਪਹਿਲੀ ਵੇਰ ਸੀ ਕਿ ਖਾੜਕੂ ਤੇ ਅਕਾਲੀ ਇਕਮੁਠ ਹੋਏ।ਕੀ ਐਹੋ ਜਿਹਾ ਸਿੰਘ ਜੀਹਨੂੰ ਸਾਰੇ ਸਿਖ ਜਗਤ ਨੇ ਐਨੀ ਜਬਰਦਸਤ ਹਮਾਇਤ ਦਿਤੀ ਹੋਵੇ,ਉਹ ਡੇਰਾ ਸਰਸਾ ਦਾ ਸਮਰਥਕ ਹੋ ਸਕਦਾ ਹੈ? ਸੰਘਰਸ਼ ਨਾਲ ਸਬੰਧਤ ਘਟਨਾਵਾਂ ਤੇ ਵਿਅਕਤੀਆਂ ਬਾਰੇ ਜਾਣਕਾਰੀ ਹੋਣ ਦੇ ਬਾਵਜੂਦ ਇਹ ਗੱਲ ਪਹਿਲਾਂ ਕਦੇ ਨਹੀ ਸੀ ਸੁਣੀ।ਇਹ ਨੁਕਤਾ ਮੇਰੇ ਕੰਨੀ ਕੁਝ ਕੁ ਸਾਲ ਪਹਿਲਾਂ ਹੀ ਪੈਣ ਲੱਗਾ ਹੈ। ਜੇ ਇਹ ਸੱਚ ਹੋਵੇ ਤਾਂ ਮੇਰੇ ਲਈ ਤਾਂ ਅਚੰਭਾ ਈ ਹੋਵੇਗਾ।ਪਰ ਇਸ ਬਾਰੇ ਚਰਚਾ ਲਾਜਮੀ ਹੋਵੇ ਤਾਂਕਿ ਹਕੀਕਤ ਸਾਹਮਣੇ ਆਵੇ।ਜੇ ਵਾਕਿਆ ਈ ਭਾਈ ਸਾਹਿਬ ਨੇ ਗੁਰਮੀਤ ਰਾਮ ਰਹੀਮ ਨੂੰ ਡੇਰੇ ਤੇ ਕਬਜ਼ਾ ਕਰਵਾਇਆ ਸੀ ਤਾਂ ਇਹ ਗੱਲ 2010 ਵਿਚ ਦਿਲਗੀਰ ਦੀ ਕਿਤਾਬ ਤੋਂ ਪਹਿਲਾਂ ਕਿਉਂ ਨਾ ਸਾਹਮਣੇ ਆਈ?੨੦੦੭ ਵਿਚ ਜਦ ਸਲਾਬਤਪੁਰਾ ਕਾਂਡ ਹੋਇਆ,ਅਸੀਂ ਤਾਂ ਉਦੋਂ ਵੀ ਨਹੀ ਸੀ ਕਿਸੇ ਤੋਂ ਇਹ ਗੱਲ ਸੁਣੀ।ਜਦ ਨਾਭੇ ਜੇਲ ਰਹੇ ਤਾਂ ਵੀ ਕਦੇ ਨਾ ਸੁਣੀ।ਜਦ 2009-10 ਵਿਚ ਜੇਲ ਤੋਂ ਆਕੇ ਫੇਸਬੁਕ ਵਰਤਣੀ ਸ਼ੁਰੂ ਕੀਤੀ,ਉਸਦੀ ਈ ਇਹ ਗੱਲ ਸੋਸ਼ਿਲ ਮੀਡੀਆ ਤੇ ਸੁਨਣੀ-ਪੜ੍ਹਨੀ ਸ਼ੁਰੂ ਕੀਤੀ।ਜੇ ਇਹ ਕੌੜਾ ਸੱਚ ਹੈ ਤਾਂ 2010੦ ਤੋਂ ਪਹਿਲਾਂ ਕਿਉਂ ਜਨਤਕ ਕਿਉਂ ਨਾ ਹੋਇਆ? ਬਾਕੀ ਜੋ ਵੀ ਹਕੀਕਤ ਹੈ,ਉਹ ਸੋਸ਼ਿਲ ਮੀਡੀਆ ਦੇ ਦੌਰ ਵਿਚ ਲੁਕਣੀ ਮੁਸ਼ਕਿਲ ਹੈ।ਇਸ ਮਸਲੇ ਤੇ ਭਖਵੀ ਬਹਿਸ ਹੋਣੀ ਹੀ ਚਾਹੀਦੀ ਹੈ ਤੇ ਸੱਚ ਸਾਹਮਣੇ ਆਉਣਾ ਚਾਹੀਦਾ ਹੈ।ਸਭ ਤੋਂ ਵੱਧ ਦੁਖ ਉਦੋਂ ਹੁੰਦਾ ਹੈ ਜਦ ਕਈ ਵੀਰ ਅਣਜਾਣੇ ਹੀ ਲਿਖ ਦਿੰਦੇ ਨੇ ਕਿ ‘ਭਾਈ ਗੁਰਜੰਟ ਸਿੰਘ ਬੁਧ ਸਿੰਘ ਵਾਲੇ ਨੇ ਸਰਸੇ ਵਾਲੇ ਡੇਰੇ ਦਾ ਮੁਖੀ ਗੁਰਮੀਤ ਰਾਮ ਰਹੀਮ ਨੂੰ ਬਣਾਇਆ ਸੀ” ਜਿਹੜੇ ਵੀਰਾਂ ਨੂੰ ਬੁਧ ਸਿੰਘ ਵਾਲਾ ਤੇ ਰਾਜਸਥਾਨੀ ‘ਭਾਈ ਗੁਰਜੰਟ ਸਿੰਘ”ਵਿਚਾਲੇ ਫਰਕ ਦਾ ਨਹੀ ਪਤਾ ਉਨਾਂ ਦੀ ਇਸ ਗੱਲ ਤੇ ਯਕੀਨ ਕਰ ਲਵਾਂ ਕਿ ਇਹ ਜਾਂ ਕਿਸੇ ਹੋਰ ਜੁਝਾਰੂ ਨੇ ਡੇਰਾ ਸਰਸਾ ਦਾ ਮੁਖੀ ਥਾਪਣ ਵਿਚ ਕੋਈ ਦਿਲਚਸਪੀ ਲਊ ਹੋਊ? ਪਰ ਸੱਚ ਤਾਂ ਸਾਹਮਣੇ ਆਉਣਾ ਈ ਚਾਹੀਦਾ ਹੈ ਨਾ!